This unusual clock uses large Light Emitting Diodes to give a slightly retro but contemporary feel to the design of this clock. Mains or battery operated (includes mains adaptor) it has all the normal functions that you would expect from a modern alarm, such as snooze as well as battery backup. It also has a low intensity pale blue white light panel on the underside which can be used continuously as a night light or switched on or off when needed. 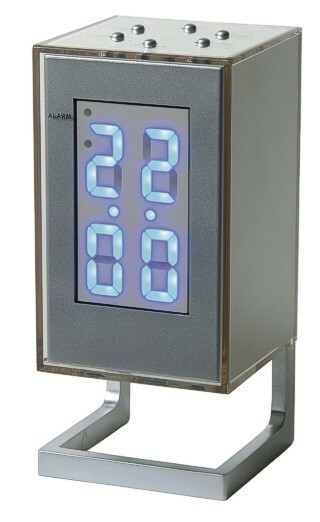 The clock is in a wonderful silver metallic finish within a transparent case and it also has blue LED's. 7 by 7 by 16 cm high ( 2¾ by 2¾ by 6¼ inches) including metallic stand.